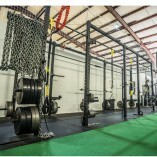 Our program is designed for any athlete and is unique to the needs of any fitness level or age. Regardless if you want to lose weight, build muscle, improve strength or speed. We offer a full assessment with sports science to every person we... train. NormaTec recovery and massage is implemented in each and every program. We provide arm care for those baseball/softball athletes in and out of season and have one of the best known jump programs for volleyball/basket ball athletes in the greater Houston Area.